NextIs Short Sleep an Inborn Trait? Will there ever be a morning-after pill prescribed for insomnia? Wouldn’t that be nice. Insomnia wouldn’t be half as bad if it weren’t so debilitating the next day. No fatigue to contend with, no brain fog, no low mood. White nights could even be enjoyable if we knew in the morning that we could resort to Plan B. For now there’s no simple way to avoid insomnia symptoms that occur in the daytime. But there are ways to minimize their impact, whether the bad nights come often or just once in a while. Here are 6 habits I find useful and maybe you will, too. This might seem like a no-brainer, but with 18 percent of Americans older than age 2 regularly skipping breakfast, it’s worth a mention. Research suggests that eating a morning meal is beneficial in many ways: it lifts the mood and improves memory, and it makes you more active in the morning. Particularly when you’re feeling sluggish and sleep-deprived, a good breakfast is a must. It used to be that caffeinated beverages were on the “No Fly” list for people with insomnia. But expert opinion has changed. The thinking now is that while the caffeine-sensitive should avoid it within 8 hours of bedtime, it’s OK in moderation—and can even be helpful—as tolerated earlier in the day. The trick is to discover what “as tolerated” means on days when you feel like drinking a whole pot of coffee. Caffeine has an average half-life of 5 to 6 hours (meaning that in 5 to 6 hours the amount of caffeine in the blood will have decreased by half). So most people can drink caffeinated beverages in the morning without fear of compromising sleep that night. But many people experience a circadian slump somewhere in the middle of the afternoon. Particularly after a short night’s sleep, that’s when you really crave a pick-up. Is a 3 p.m. cappuccino going to set you up for another bad night? Not necessarily, if you’re young or middle-aged. But it takes older adults longer to metabolize drugs. Keep this in mind as you decide when to drink that last cup of joe. Even mild dehydration can depress your mood, lower your ability to concentrate, and make tasks feel more difficult. It can also impair performance and short-term memory. So make a point of sipping often throughout the day. Keeping water on hand at your desk, or making frequent trips to the water cooler, could take the edge off a low mood and make it easier to accomplish what needs to be done. Physical activity tends to elevate mood and alertness. New Zealand researchers found that subjects who reported higher levels of habitual physical activity also endorsed higher levels of interest, excitement, enthusiasm, and alertness—all qualities you may be short on if you’re short on sleep. Particularly if your work keeps you sedentary, make an effort to get up, move around a lot, and stretch at your desk. At lunchtime, take a walk. Increasing your exposure to sunlight may also help to counteract symptoms of insomnia. Bright light tends to increase vitality and elevate mood. It’s also been shown to enhance alertness and cognitive performance. Even on cloudy days, daylight is 2 or 3 times brighter than normal office lighting. So make liberal use of it when you can. Particularly if you’re feeling sluggish, spend time outdoors or inside where there are plenty of windows. You may not have much say in how you organize your day. Whatever tasks are on the schedule—make sales calls, teach a class, chair a meeting—you’ve just got to power through them, never mind that you’re exhausted when the day begins. But sometimes you can reset the agenda. After bad nights, juggle your tasks so you tackle the hard ones when you’re normally most alert and save the routine tasks for when you’re not. Doing all these things may not have a big impact on your nights. But they may help you chart a steadier course during the day. That counts for something, don’t you think? Lois Maharg has worked with language for many years. She taught ESL, coauthored two textbooks, and then became a reporter, writing about health, education, government, Latino affairs, and food. 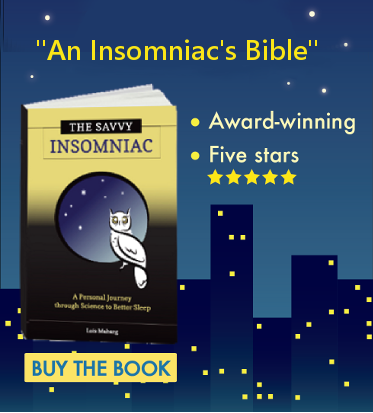 Her lifelong struggle with insomnia and interest in investigative reporting motivated her to write a book, The Savvy Insomniac: A Personal Journey through Science to Better Sleep. She now freelances as an editor and copy writer at On the Mark Editing. Do you have trouble falling asleep or staying asleep? 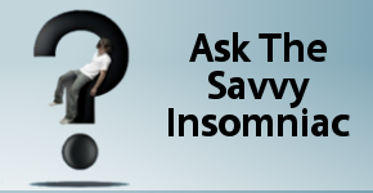 Have you tried insomnia remedies and found that nothing worked? If you’d like to chat one-on-one, this is the place to do it. Is Short Sleep an Inborn Trait? Interview: Does Melatonin Work for Insomnia?